The Book of Wisdom was written for Jews living in a hostile environment, facing the threat that fellow Jews would assimilate. Here the writer tries to strengthen their resistance by revealing their enemies' thoughts. 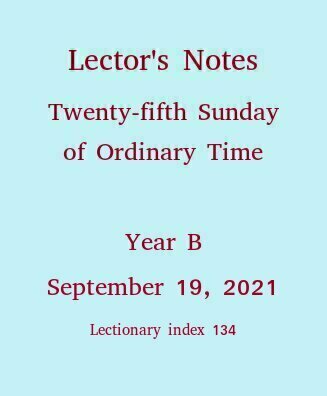 The letter of James tries to unify the community by solving doctrinal disputes and giving practical advice for living together peacefully. This passage traces some of the communities problems to the peoples' feelings of jealousy. In this passage, the disciples fail to understand Jesus' second prediction of his suffering, death and resurrection. Then they show that they don't understand Jesus' convictions about greatness and humility, either. Our Liturgical Setting: Saint Mark's gospel has three episodes, in chapters 8, 9 and 10, where Jesus predicts his passion, death and resurrection. We read the second of these as today's gospel, Mark 9:30-37. The first reading prepares us to hear that gospel passage. The Historical Situation: In many of our readings, we hear from prophets, priests and historians addressing Jews concentrated in their rather exclusive homeland. The Book of Wisdom was written in a different situation. Its audience was "the Diaspora," by which we mean the dispersed Jews living in mostly pagan cities, particularly the cosmopolitan city Alexandria, in Egypt, around 100 B.C.E. (For more on Alexandria and its Jewish residents, click here.) The author wanted his fellow Jews to embrace wisdom, by which he meant faithful adherence to their ancestral religion in their somewhat hostile environment. The Author's Literary Tactic in This Passage: Now just as history is written by the winners, Scripture is written by the believers. In this case, the believer is trying to "psych out" the unbeliever. The believer is reading the minds of his oppressors, so he can thwart them by standing up to whatever they plan to throw at him. At the same time he's psyching himself up by reminding himself of everything he does believe that's contrary to what the oppressors believe. Your Proclamation: You're not speaking the words of the good guy this time, but of the wicked. You should sound like an innocent person's caricature of a wicked one. This shouldn't be hard. Just remember the last time you mentally made fun of that reckless driver, of the snob who seemed to disapprove of your appearance, of the oblivious jerk in the seat in front of you who kept talking through the movie. Now the wicked one quoted here has his own mental caricature of the just one. That calls for a sarcastic tone at phrases like "God will defend him," "Let us have proof of his gentleness," and "according to his own words, God will take care of him." The Literary, Historical Background: James is emphatic about the contrast between spiritual wisdom and earth-bound wisdom. In verses prior to today' selection, he says, "But if you have bitter jealousy and selfish ambition in your hearts, do not boast and be false to the truth. Wisdom of this kind does not come down from above but is earthly, unspiritual, demonic." This is like the contrast he drew in the reading from three Sundays past, James 1:17, asserting that God gives only good, and evil has another source entirely. Your Proclamation: Today's passage bemoans the consequences when members of the church prefer the wrong wisdom. Once you know that, deciding how to proclaim this should be straightforward. You are just asking people to do what's right, and explaining, emphatically, what's wrong about doing wrong. Assume that Saint Mark's program is to disclose Jesus as he understood himself, illustrating how easy it is to misunderstand Jesus, especially over the issue of his suffering, death and resurrection. It's easy enough to tease this point into a ferverino fostering individual piety. But how should the church, corporately, assess its knowledge and obedience of Jesus in light of today's gospel? Let's ask how much we're concerned about our greatness, our status among other organizations. Let's ask how we can serve the needs of others, thus embracing the only kind of greatness that Jesus endorsed. Saint Mark pillories those who wanted to make Jesus a simple miracle-worker, ignoring his call to take up the cross. In what ways is our religion, personally or corporately, dominated by the desire to get God to do us favors, rather than be the desire to learn and do God's will? 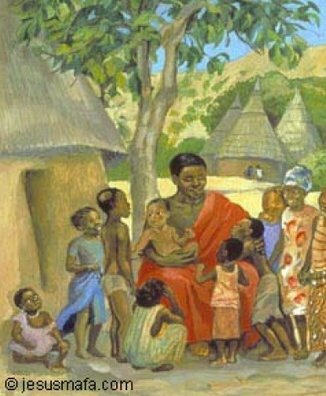 "Jesus welcomes the children" (detail), from the site Jesus MAFA, a work for the spreading of the gospel, based in Cameroon, a country in Central Africa. Click here for a larger version, an opportunity to purchase a poster of the painting, links to other works of Jesus MAFA, and a chance to practice your French.